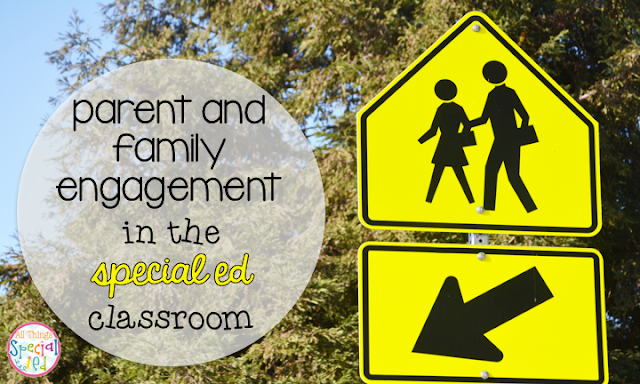 Your way to successful parent engagement - All Things Special Ed. Don't we all want our students to have: better grades, better attendance and homework completions, positive attitudes, higher graduation rates and high rates of college enrollment? Research shows us that when family involvement is increased these things can happen! But how can we do that? Here is a list of ideas to help get your families engaged and be on your team! 1. The first thing I do is create an open line of communication. This is crucial as a teacher and especially for special ed. I call parents before school has started, to introduce myself, and go over any questions or concerns they may have. I also will send the students a letter or postcard home so they can get to know me if they don't already. 2. Focus on the successes of each child. I again, call, email, and/or send notes home in the first month of the school year celebrating a success of their child. Who doesn't love hearing something good that their child has done? I sure do (and would love to hear more!) Trust me, parents and or caregivers will be more receptive to you if you do need to come with them due to a problem than never having a conversation with you before that. 3. Strengthen your families knowledge and skills to help support their families. This could be anything from a math or reading night that many school already do and make sure you are there to host something in your room that you know your students could participate in. Another idea is to host special education families for a night (may be every quarter or trimester) where you discuss different topics for them to learn about such as autism, adhd, organizational and study skills, Love and Logic-- the list can go on! May be even send a survey out to families for ideas and suggestions. 4. Encourage your families to get involved at the school if they can. It could be inviting them to read to the class, help with seasonal projects, chaperone events and field trips or come help for field day. Anything for them to come to the school and feel they are helping and getting to know you and the school. Depending on the class you you have (pull-out, autism classroom, or inclusion), you may want to send out weekly newsletters to help families stay in touch with what is happening in and around the school. For my special ed. students, some have daily communication logs or an agenda to write notes in from the day (and don't forget to add a positive comment or success!). I also have space for parents to comment back as well. This is sure helpful to give you insight if a child might not be "off" or upset in someway. Do you have a school webpage for teachers? That is another way to have families stay connected. Want to hear more about how to get family and parents engaged? Here are a few more blogs on the topic that I thought you would love to read! Links will be added shortly!